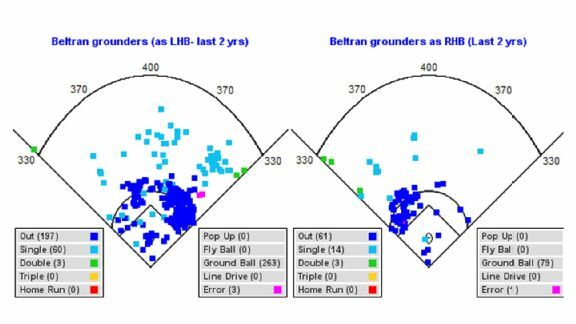 What should you know about Carlos Beltran from a statistical perspective? He’s going to enjoy Yankee Stadium. 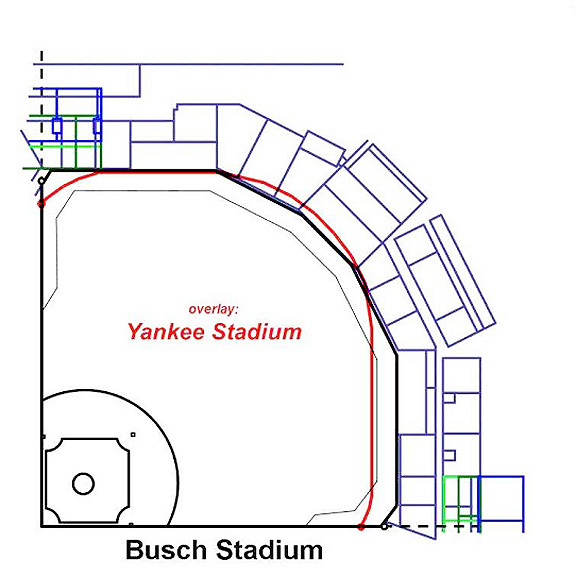 Check out the difference in dimensions between Busch Stadium and Yankee Stadium in the image below. Then consider this: Beltran hit 32 home runs at home the last two seasons, only one fewer than Yankees slugger Robinson Cano, and Beltran was hitting in a ballpark much less friendly for left-handed hitters. That should also help Beltran from a defensive perspective as he’ll have considerably less ground to cover when he plays right field. Beltran rated below average there last season, with minus-six Defensive Runs Saved. Yes, Beltran was injured in 2009 and 2010. And yes he has to rest occasionally, but he plays and plays a lot. He’s averaged 146 games and 137 starts over the last three seasons. Much like former Yankee Curtis Granderson, Beltran has enjoyed the role of the No. 2 hitter, especially in the last two seasons. This has been most noticeable against right-handed pitching. Consider these two splits from 2012 and 2013. Beltran has a .333 batting average, .445 on-base percentage and .683 slugging percentage in postseason play. The only player with at least 75 plate appearances to finish their career with numbers that good is Lou Gehrig (.361, .482, .731). Beltran has hit 16 home runs in 180 postseason at-bats. His rate of one home run every 11.3 postseason at-bats rates second-best among active players, trailing only Nelson Cruz (one homer every nine at-bats). Add Beltran to the list of Yankees who will likely see their share of infield shifts. Beltran may actually be shifted when he’s hitting both left and right-handed. You can look at both spray charts in the image below. Beltran actually warrants the adjustment more as a right-handed hitter than as a lefty. As a right-handed hitter the last two seasons, he’s hit only seven of 79 ground balls to the right of second base. As a lefty, he’s hit 23 percent of balls to the left of second base, making him a borderline shift candidate. The Red Sox didn’t hesitate to shift against him during the World Series and we suspect the Orioles, Rays and Blue Jays will do likewise, since they are among the teams that use defensive shifts most often. Beltran has 358 home runs, the same number in his career as Yogi Berra did. They’re tied with Carlos Lee for 81st all-time. Beltran’s next homer will tie him with another former Yankee, Johnny Mize and his third homer of the season will even him with Joe DiMaggio. Beltran played 839 games for the Mets from 2005-11. The only player to play more games for the Mets and then play for the Yankees is Darryl Strawberry (1,109). If Beltran reaches 30 homers this season, he would be just the third Yankee to hit at least 30 home runs at age 37 or older. Babe Ruth (41 in 1932 and 34 in 1933) and Jason Giambi (32 in 2008) are the only players to do that in pinstripes. In six career games at the new Yankee Stadium, Beltran is 7-for-19 with two doubles and six walks. His .368 batting and .520 on-base percentage are both his highest at any park where he has played at least five games. Beltran has yet to hit a homer at the new Yankee Stadium. The only other current stadium that he has played at without a homer is Petco Park (79 at-bats). Beltran has a .654 OPS in 31 games versus the Rays, his lowest OPS against any team in his career. He has been even worse at Tropicana Field, with .594 OPS and just one homer in 56 at-bats.